Millions of Americans must learn to live with type 2 diabetes, a serious yet manageable condition with the right treatment. Sixty-nine-year-old Janice “Granny Jan” Cox of Pilot Mountain, North Carolina, has struggled with it for most of her life. Taking care of herself in the face of caring for family proved to be a challenge at times, and she didn’t always mesh well with her doctors. After many ups and downs over the decades, she’s hitting her stride with her new physician, Dr. Kellie Faulk of Novant Health Intensive Diabetes Care Management in Winston-Salem, North Carolina. Faulk and Cox say others with type 2 diabetes can learn a lot from Cox’s journey. Type 2 diabetes renders one’s insulin incapable of doing its job: to carry glucose out of the bloodstream. When that doesn’t happen, sugars remains trapped, acting as a poison to the body and causing great damage to the blood vessels. This puts patients at greater risk for a number of other ailments that can affect their vision, feet, kidneys and heart. It also increases risk of heart disease , with individuals being two to four times more likely to die from heart disease than adults without diabetes, Faulk said. Both Cox’s grandmother and father had diabetes, so her mother took extra care tending to Jan’s diet as a little girl. In her early 20s, though, it took a car accident to reveal that she had the disease. “I pulled out in front of another car I didn’t see — my side vision was gone,” she said. Soon afterward, she was diagnosed with type 2 diabetes. “To be honest, I went through a period of anger, rebellion,” she said, “and I didn’t realize the seriousness of it.” Cox, a divorced single mother of two, had just moved in with her parents to help care for them after her father became blind — a result of diabetes. Having witnessed her father battle it — which also led to a leg amputation — she was not ready for the same fate. She was already overwhelmed, and found the news discouraging. Over the decades, Cox went through both good years and bad years, overall doing well enough to fend off major setbacks in her health. A big obstacle was finding a doctor she worked well with. “Diabetes brings both a physical and emotional burden,” says Faulk. “When Jan first arrived to our clinic, her mentality was very self-critical. ‘I can’t do this, therefore I won’t do this — therefore I’ll probably fail.’” This is frequently seen among patients who are also busy caring for loved ones at home, like Cox, who often helps out with her grandkids and great-grandkids. Then Cox’s longtime regular physician, Dr. John Card of Novant Health Winston-Salem Healthcare, referred her to an endocrinologist. “Thank the Lord Dr. Card recommended Dr. Faulk,” she said. “The very first day I met her it was like I’d always known her. It clicked.” Having tried several other specialists before, she’d finally found one that gave her hope. Faulk clarified complex medical language for Cox and showed her affordable medication options. So in January of this year, Faulk and her team began to help Cox track her progress. “I’ve got a daily log, where I test my sugar four times a day,” Cox said. This allows Faulk to track Cox’s blood sugar fluctuations throughout the day, helping to identify what triggers drops or spikes. For instance, when the team noticed that Cox’s glucose levels tend to climb in the morning, eventually they found out why: Cox enjoys fruit as a comforting bedtime snack, just like her dad used to. Discovering habits like this one helped her care team find a solution. Medics rushed Cox to Novant Health Forsyth Medical Center. They swiftly brought her to the catheterization laboratory, where they informed her that she was having a heart attack. Thankfully, however, she pulled through and after a series of tests was sent home that Saturday. “I have no doubt that God had me in the right place, at the right time, with the right people,” she said. Today, Cox enjoys a full life with her family — her son and daughter, three grandchildren and two great-grandchildren — all living in Pilot Mountain. Since her heart attack, she has lost 14 pounds through a cardiac rehab exercise program and a new carb-counting diet. She now regularly uses an exercise bike. Faulk wants others with type 2 diabetes to not let discouragement derail their own self-care management. “It’s never too late to make it better,” she said. “If you choose to be actively involved in managing your diabetes, you and the family around you will benefit greatly, both now and in the future.” Anyone can achieve progress if they decide to take control of their diabetes, rather than let it control their lives. Novant Health offers type 2 diabetes group education classes at no charge to patients. (Click here to find a course offered near you.) To schedule a consultation at Novant Health Intensive Diabetes Care clinic, either click here or call 336-718-7500. 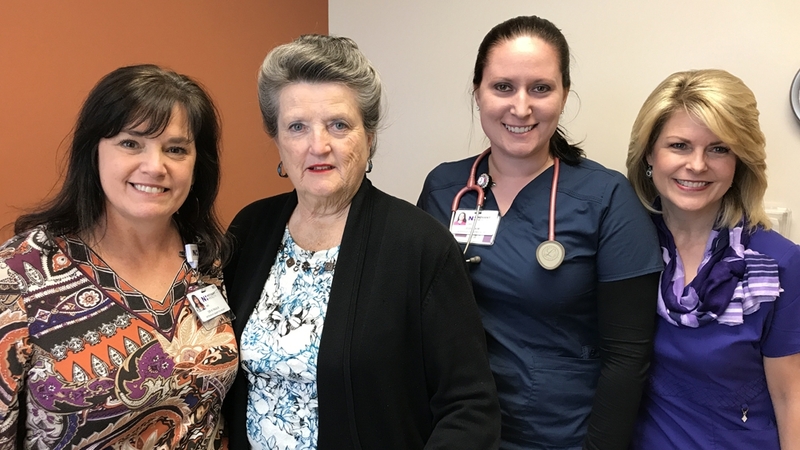 Photo: from left to right is Dr. Kellie Faulk, Janice Cox, Jessica Mabe, CMA (Certified Medical Assistant); and Wendy Mizell (Patient Services Coordinator Lead).